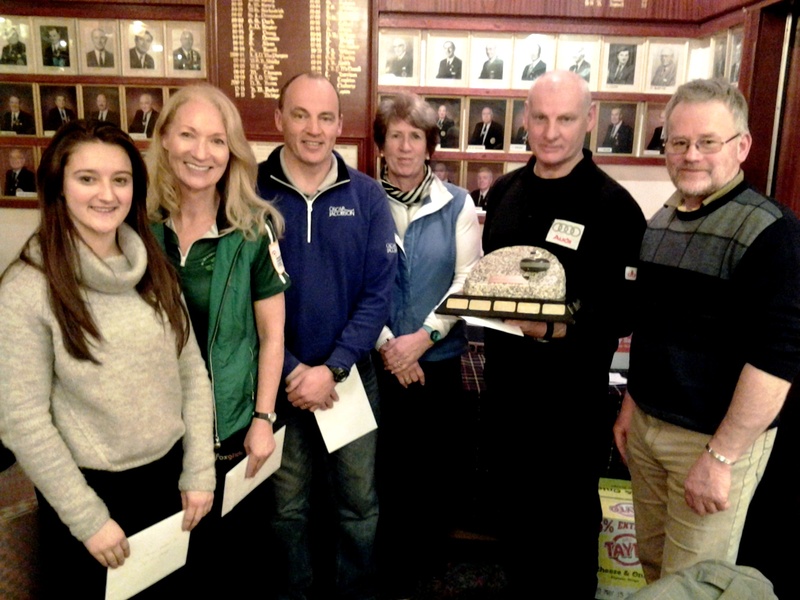 Peter Wilson and his rink of Lauren Morgan, Gerald Bailey and Margarita Sweeney-Baird were the popular winners of the Stranraer International Weekend Bonspiel, topping the High Road with seven points. 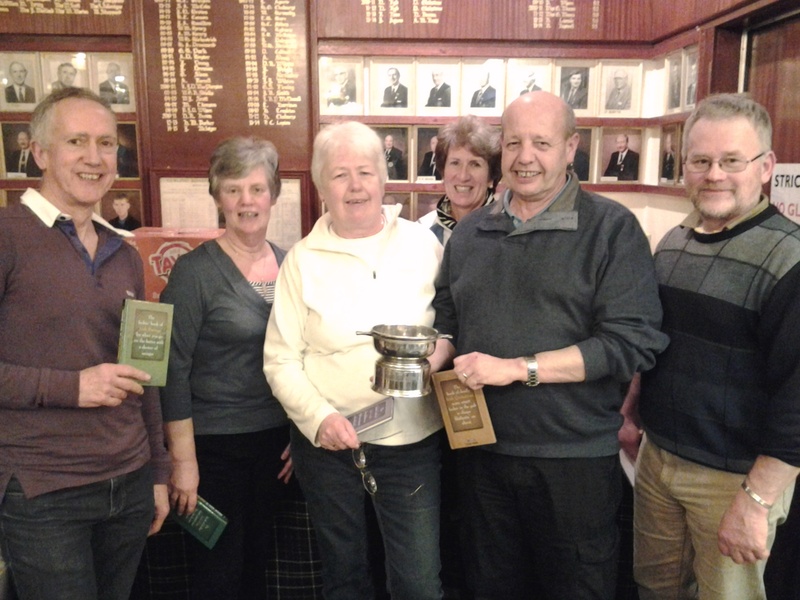 Runners-up on six points were Stewart Wilson (Peter’s brother), Elaine Turnbull, Tommy Campbell and Anne Stenhouse on six points. They had the same points and ends as Johnjo Kenny’s team but had a better shots total. 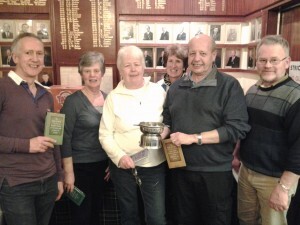 John Burns’ team were fourth on six points. 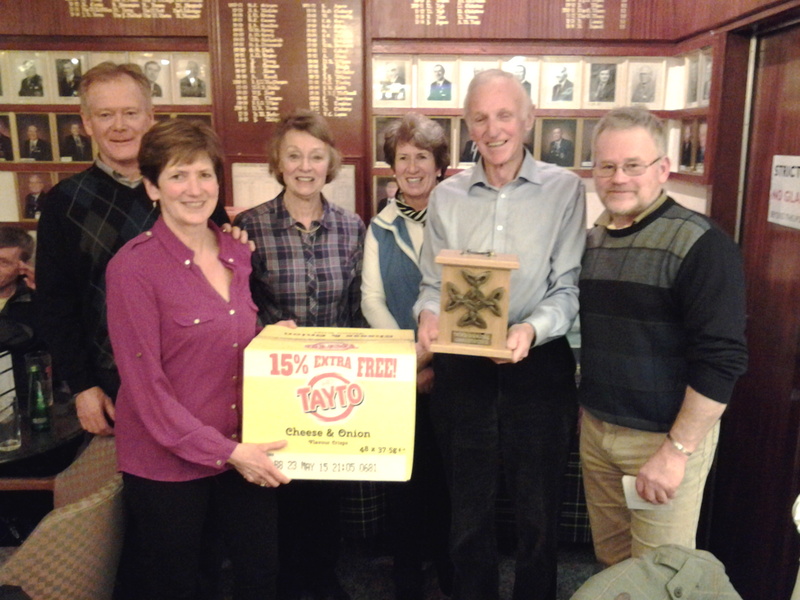 Neil Fyfe and Jim Cullen scored five points, PJD Wilson three and Bill Byers held up the High Road section on two points. In the Low Road competition, the winners were Michael Sutherland, Fiona Turnbull, Ross Barr and Alison Barr on six points. 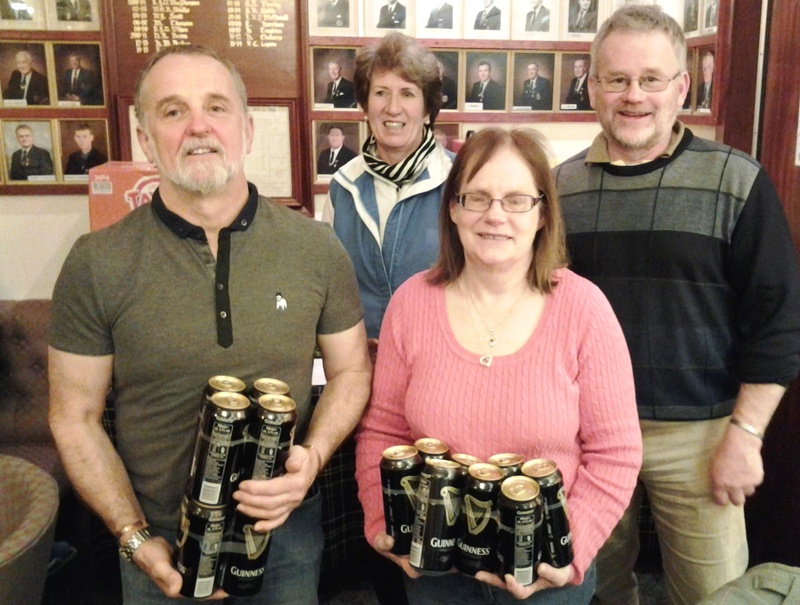 The runners-up were Andy Robinson, Rhona Robinson, Alan Griffiths and Rosemary Griffiths on four points. At the end of a grand weekend of curling, cuisine and craic, ICA President PJD asked wife Anne to hand over £25 McMillan Castle Hotel vouchers to the High Road winners; Tipperary Crystal wine glasses and boxes of red wine to the runner-up; boxes of Tayto crisps to the Low Road winners; Irish themed books to the Low Road runners-up and the consolation prize of cans of Guinness to newcomer Ken Hutchison’s team. 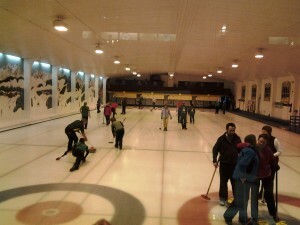 Ken and Anne Hutchison were taking part for the first time. 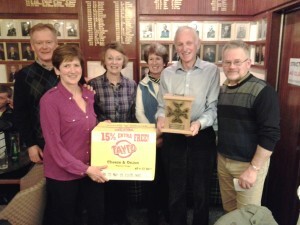 It was great to welcome new member Jonny Harper over from Belfast to play in his first ICA event as lead to Marie O’Kane but the talking point of the whole weekend had to be Irish Pete’s fantastic last end last shot double raise double take out on Sunday morning to score four for the win against PJD when he was two down and PJD had one shot and was possibly lying two, with both stones buried behind a wall of stones. We are hoping to get the clip of the ‘shot of the weekend’ from the Stranraer Ice Rink video tapes for the ICA webpage. 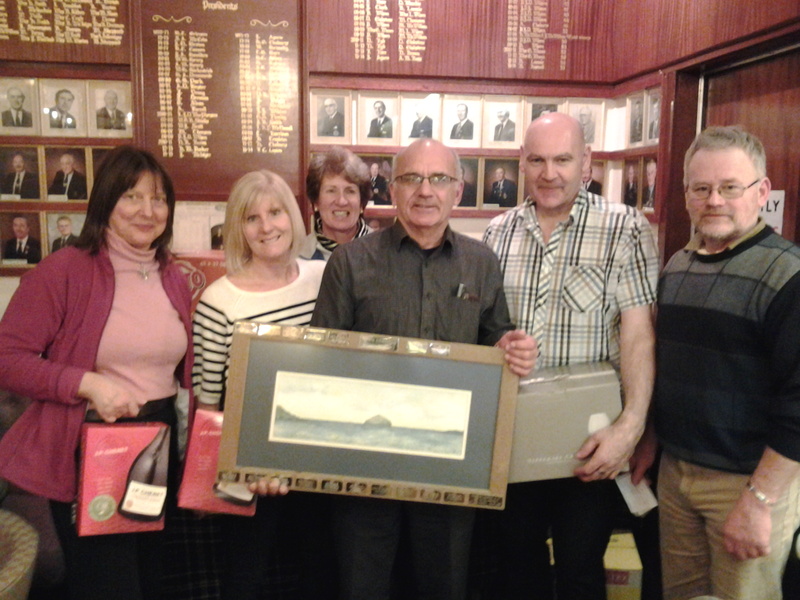 Saturday night’s raffle raised £300 for ICA funds. 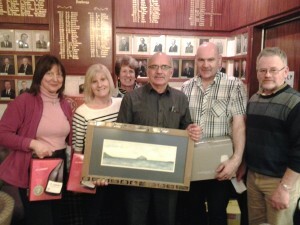 Thanks to all who brought raffle prizes and bought tickets.